Hello! I took piano lessons when I was young but it, uh, didn't take. I really wish it did because it would be just awesome to sit down at a piano and make music. But in the meantime, I do enjoy adding musical elements to my cards (and having my kids take piano lessons in hopes that it takes - heehee). I first started with a base and scored two lines around each edge with the Scor-Buddy. I then made several die cuts (love my dies! ): one Memory Box Amira Flourish out of white card stock, Memory Box Virtuoso Music in gold foil and black card stock, and Poppystamps Serendipity Bird Frame out of red card stock (I only used the birds from this die). I glued the two Virtuoso Music slightly offset from each other for a shadow effect. The red birds were popped up with small Joy! foam pads cut into triangular shapes. I added a little sentiment from ODBD Just a Note with gold detail embossing. 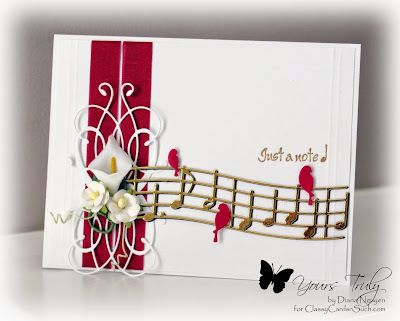 I found some flowers and some red seam binding to add to my card. Thank you for looking and hope you like my musical creation! Always love to see your beautiful colorways and composition....this one is outstanding!